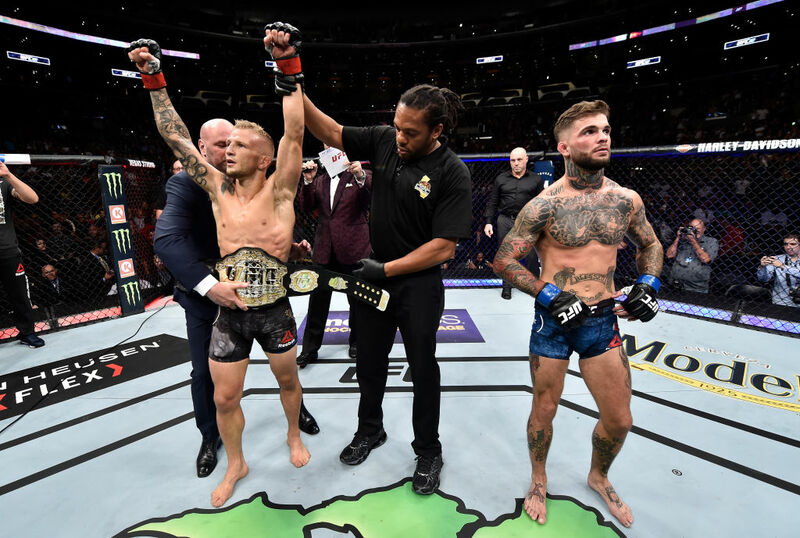 Who were the winners at UFC 227: Dillashaw vs Garbrandt 2? Click below to get the results for all the fights at STAPLES Center in Los Angeles on Saturday, August 4th, 2018. Good movement from both bantamweights early. Garbrandt with a good combo that Dillashaw follows up with a kick to the body. Garbrandt hits Dillashaw with a left that stumbles the champ. Garbrandt points to the center of the Octagon and the crowd loves it. Garbrandt lands a huge shot and he rushes in but Dillashaw wasn’t quite done yet and drops Garbrandt with a huge shot! The two were absolutely throwing bombs! Dillashaw’s right eye is swollen but. Dillashaw catches Garbrandt with a massive right hook as Garbrandt closes the distance. Hitting Garbrandt with blow after blow, Garbrandt is stumbling around the Octagon and is barely holding on. Dillashaw with a big knee. Garbrandt gets to his feet somehow but he can’t recover due to the incredible outburst from Dillashaw. AND THAT’S IT! UFC 227 Official Result: Dillashaw defeated Garbrandt by TKO, first round 4:10. And here we go! The flyweights exchange a variety of kicks in the first minute, with Johnson pressuring Cejudo on the outside of the cage. A lot of hand checking and movement in the first two minutes, Johnson barely misses with a head kick and then blocks a head kick attempt from Cejudo. Redness already starting to show on the back of Cejudo’s left knee from Johnson’s leg kicks. Cejudo has officially lasted longer than he did in his first fight with Johnson. Johnson with a solid kick to the body. Great movement from Johnson to stay out of harm’s way, Cejudo hasn’t been able to get his hands on him yet. And then will less than a minute to go in the round Cejudo is able to catch Mighty Mouse with a punch when he was off balance and get a take down and a couple shots to the champs body. The second round starts with both fighters meeting in the center of the Octagon. Johnson attempts a single leg but Cejudo shuts the attempt down and the two go back to the stand-up game. Johnson with another great leg kick, the redness starting to really be evident on the legs of Cejudo. Cejudo lands a good punch and Johnson nearly misses with a head kick. Those lead leg kicks are starting to get Cejudo’s attention as he switches stances. Johnson continues to defend well, all the while tagging Cejudo with kicks to the inner and outer thighs. With 1:10 left in the round, Cejudo is able to take Johnson down and end up in half guard. The former Olympic gold medalist is able to prevent Johnson from getting up and hits him with a few knees as the bell rings. Good round for Johnson, other than that take down he was outworking Cejudo. Johnson starts the third round off by landing a solid knee to Cejudo’s mid-section, then proceeds to chase him around the Octagon. The two briefly clinch, with a Cejudo coming out in the dominant position on the ground but Johnson gets back to his feet and pins Cejudo against the cage. Yet another leg kick from Johnson, but Cejudo comes in over the top with a right cross that finds home. Just moments later the two fighters have an almost identical exchange. Cejudo goes for a take down and gets in then Johnson turns the tables, ends up on top of Cejudo for a just a moment before the two get back to their feet. A little cut has started to form in the corner of Cejudo’s right eye. Cejduo gets another take down but Johnson flips him within seconds yet again. Sweat dripping from the two co-main event fighters as we hit the fourth round. Johnson strikes first in the round with a nice cross. After a Johnson slip the two fighters scramble on the mat but just like in the other rounds Johnson gets back to his feet almost immediately. Good left hook for Johnson at the 3 minute mark of the round. Johnson still using those leg kicks and connects with a body kick that makes Cejudo motion for more. With just over two minutes in the round Cejudo and Johnson hit the mat with Cejudo coming out on top again, this time in side control. The remaining minute of the round featured Cejudo in top-control dealing no significant damage to Johnson. Well done by Cejudo, he never gave up on getting that control. Final round! Johnson is back at those leg kicks. A minute has gone by and it’s been all Johnson so far. Johnson with another solid kick to the body. Cejudo caught Johnson with a punch as he slipped but Johnson was able to quickly get his feet and move away from Cejudo. Johnson with a good hook over the top as well as a nice leg kick. Cejudo cornered Johnson with just about 2 minutes to go and grabbed hold of the champ, looking to secure another take down but Johnson was able to flip the positon of the clinch. Cejudo was able to bring Johnson down just for a second with a bout 1:10 remaining in the fight before Johnson got back to his feet. Cejudo land a shot and Johnson returned fire, both fighters looking as fresh as when the fight started. With just 15 seconds left the two fighters started absolutely going for it. Firing as many punches as they could. Great ending, what a fight by both Johnson and Cejudo. UFC 227 Official Result: Cejudo (48-47, 48-47) defeated Johnson (49-48) by Split Decision. Both fighters taking a little time to get used to one another as the crowd breaks out into chants of “let’s go Swanson”. As they do so, Moicano lands some nice jabs and crosses on Cub. Cub with some good movement followed by a head kick and a cross to the body. Moicano responds with his own body kick. Out of almost no where Moicano drops Cub with a jab and then pounces on him bombarding him with strikes but Cub momentarily got back to his feet before Moicano took him back down to the canvas. The With Cub on his back the crowd cheers him on resuming his their chants but it can’t save the fan favorite as Moicano gets in position and sinks in a rear naked choke for the win. UFC 227 Official Result: Moicano defeated Swanson by submission due to a RNC, first round 4:15. Viana focusing on her kicks early on, mixing it up her targets each time. The two strawweights engage in the clinch with Aldrich earning a takedown that last a split-second before Viana made it back to her feet. After a few minutes in the clinch the two fighters separate, with Aldrich landing a solid cross. Aldrich gets her second take down and the round ends with Aldrich on top. Aldrich opens the rounds swinging, hitting Viana with a right hook. Viana closes the distance and puts together a couple punches combined with a body kick. Viana nearly trips Aldrich to the ground but the fighter out of Colorado holds her ground. Both fighters started throwing hands, with each having their moments. A stiff jab from Aldrich shot back the head of Viana and then Viana continued to attack with her kicks. Aldrich started to find her rhythm, landing some good shots. In the final minute of the round Viana secured a take down, but lost dominant position as Aldrich was able to flip around into Viana’s guard. Good round from Aldrich. Viana much more aggressive to start the final period. Her pressure sends Aldrich back pedaling and circling the Octagon. Aldrich is able to get control and bring Viana to the mat. At the half-way mark of the round referee Herb Dean told the ladies to work and after a full minute Aldrich backed off Viana and urged her to stand-up. Then she put together a nice cross that drew a cheer from the crowd. In the final 30-seconds of the fight it was Aldrich pressing the action landing a hook and cross combo just before the final bell. UFC 227 Official Result: Aldrich (29-28, 29-28, 29-27) defeated Viana by Unanimous Decision. Holland comes out busy but Santos quickly lands a really nice body kick and then takes Holland down. Holland goes for an arm bar but Santos is able to toss and turn until he is free and ends up on top of Holland. Santos drops some big shots from above, using his power but Holland is fight back, landing some elbows from the bottom. After Holland goes for a couple up kicks, Santos gets back into Holland’s guard. Santos attempts a massive right hand but hits the canvas instead. Holland has spent nearly the entire round taking shot after shot from Santos. With less than a minute to go Santos finally lets Holland back to his feet. Santos lands a big body shot and the round ends with the two fighters in the clinch. Holland and Santos start the round off landing simultaneous body kicks, except Santos’ shot hit the groin of Holland. Holland and Santos chat a bit and then Santos connects with a massive head kick that jars the mouth piece from Holland’s mouth. Santos takes Holland down and advances to full-mount but Holland is able to break free. Santos throws head kick after head kick but Holland is blocking them. Holland absorbs another huge kick to the body and then Santos brings him to the ground. After getting to his feet Holland and Santos start throwing their hands with Holland landing the better of the shots and Santos missing a spinning back fist. Holland takes down Santos and lands in side control and immediately starts dropping some massive elbows down. Holland gets into the full-mount position and is able to execute more ground and pound as the round comes to a conclusion. Crazy second round. The third round starts with a roar from the crowd and double high-fives in the center of the Octagon from the two middleweights. Holland lands a strong left but Santos charges through it and attempts a cartwheel kick that narrowly misses. Santos brought Holland to the ground and eventually transitioned into a full mount. But Holland was able to wildly break free. The ref stood up the two fighters and Santos wobbled Holland with big punches and more body kicks until Holland plunged forward to avoid the strikes. Santos moved into yet another full mount where he locked up an arm triangle, but Holland was able to break free. UFC 227 Official Result: Santos (29-27, 29-27, 29-26) defeated Holland by Unanimous Decision. The two ranked bantamweight touch gloves and then Munhoz opens with a couple head kicks blocked by Johns. Johns connects with a nice left but Munhoz covers up before he can take any more damage. Both bantamweights landing effective shots early. Johns with a big left hook over the top but Munhoz is game and lands the same punch on Johns. Both guys connecting on shots in the center of the Octagon. Johns went for a takedown but Munhoz hit him with a knee that opened up a cut on the bridge of Johns’ nose. High energy high output first round from the bantamweights. After the two slugged it out in round one we were in store for more of the same in the second. Neither fighter backed down in the first minute keeping the pace going, with Munhoz eventually landing a really nice lower leg kick that appeared to damage the left leg of Johns. Munhoz connected a big shot to the body of Johns that sent him crumbling to the ground in pain. Munhoz pounced and landed hammer fists and shots to the body but Johns survived. Then a mad scramble ensued with Munhoz attempting two submissions in a row but Johns escaping. Once the two stood up the crowd left out a huge cheer. Munhoz landed a really nice lower leg kick that appeared to wobble Johns. Then Johns connected with four massive strikes in a row with Munhoz returning fire. The crowd is roaring for the two 135 pounders. With less than 30 seconds to go Munhoz hits Johns with a huge head kick that stuns Johns. The crowd is screaming as the round ends. Both Johns and Munhoz took massive damage that round. Wow, this is definitely the fight of the night so far. Both fighters looking a little tired after a crazy second round. Munhoz with a massive kick to the body that makes Johns wince and cover up his torso. Munhoz hits him with a left hook and then follows it up with a submission attempt that Johns somehow escapes. In side control, Munhoz utilizes his ground and pound game, but Johns is able to get to his feet with a minute remaining. Great fight from both bantamweights. UFC 227 Official Result: Munhoz (29-28, 29-27, 30-26) defeated Johns by Unanimous Decision. Looking to negate the size advantage that Jackson has Simon closed the gap and secured an early take down. But Jackson stood up almost immediately. In the clinch the two fighters exchanged knees, with Jackson using leverage to hit the body of Simon. Simon rushed Jackson and landed a nice left to the body but then got out of the way of Jackson’s long arms. Simon displayed his strength and he lifted Jackson above his head for a takedown, but he couldn’t keep Jackson on the canvas. Another double leg from Simon another take down followed by Jackson getting to his feet. Good left hook from Simon connects but then again he quickly gets out of Jackson’s range. As the round comes to a close Simon gets a double leg takedown. Jackson patient as he waits for Simon to rush. Simon rushes, absorbs a shot to the body, takes Jackson to the canvas but Jackson turns the tables and lands on Simon’s back. After a quick scramble both fighters get back on their feet, with Simon grabbing ahold of Jackson in the clinch. To this point, Simon has been the busier fighter. Jackson has lands a couple punches but Simon returns fire with a hook of his own. In the last minute of the round, Jackson barely missed a head kick as Simon charges him. Simon takes down Jackson and quickly takes his back for the remainder of the round. Jackson connects with a good jab cross but that doesn’t stop Simon for hunting him down. Simon tackles Jackson to the ground and looked to attempt a rear naked choke but Jackson put him on his back. Simon took a couple small bunches and then the two ended up back on their feet. Jackson cornered Simon and landed a big knee but Simon ducked out of trouble, shot for a takedown sending Jackson through the air and the quickly moved into full-mount. Jackson gave-up his back and was eventually able to force his way to his feet. Simon immediately lifted Jackson off his feet and carried him a few feet before slamming him back to the canvas. With less than a minute left in the fight Simon tripped Jackson securing what feels like his 100th takedown. Dominant grappling and wrestling from Simon throughout the entire fight. UFC 227 Official Result: Simon (30-27, 30-27, 30-27) defeated Jackson by Unanimous Decision. Kang focusing leg kicks early with Ramos in control of the center of the Octagon. The athleticism of Ramos is obvious as he attempts spinning kicks and kicks from different angles. Ramos backed down Kang and tagged him with a straight right then followed it up with some nice combos that had Kang ducking and covering up as he absorbed damage. But Kang regained composure and escaped. Both fighters are connecting clean with some leg kicks that send shockwaves out to the audience. Kang takes down Ramos but Ramos shoots right back up. A spinning backfist attempt by Ramos leads to a takedown for Kang, but once again Ramos gets right back to his feet. Ramos connected early and often to start off the second. Hitting Kang with a variety of clean shots that had the crowd cheering. Ramos landed a nice body kick but Kang caught it and retaliated with a lower leg kick sending Ramos to his back with Kang on in top position. On his back Ramos was able to attempt a kneeler before Kang was able to wriggle free. Then Kang immediately attempted a standing guillotine but Ramos slammed him down and broke free. After spending the entire first round striking, both fighters tryed to get an advantage on the ground. In the final seconds of the round Ramos secures a double leg take down just before the bell rings. Both fighters looking fresh at the top of the third. Lots of feints from Ramos as he tries to set-up his strikes. Straight right cross from Ramos causes Kang to cover up and Ramos lays on the heat. Kang doesn’t back down and forces Ramos to retreat. The jab starting to work for both fighters as they stand in the center of the Octagon and exchange. Kang connects with a jab, cross and a hook but Ramos doesn’t seem phased at all. With a minute left in the fight, Ramos gets a brief single leg takedown. After getting to his feet Kang worked his jab and the fight came to a close. UFC 227 Official Result: Ramos (29-28, 29-28) defeated Kang (29-28) by Split Decision. The FX prelims are underway after Moraes and Sayles touch gloves. Moraes with some good dirty boxing in the clinch before hitting Sayles with a good right head kick. Sayles immediately shakes his head to let the crowd know that he’s good. Both featherweights are throw some knees in the clinch, with Moraes landing an elbow on the way out. Once again, Sayles shakes his head after the exchange. The two clinch in the center of the Octagon and trade a pair of knees before they get back to striking. Moraes landed another body kick but Sayles caught his leg as it hit his side but both fighters still looking to take over. Moraes lands some vicious shots to the body right as the round begins. Sayles attempts a single leg but Moraes is able to stuff Matt’s efforts. Sayles apply more pressure this round and tagged Moraes with a spinning back fist as he retreated. Moraes started letting hit fly, catching Sayles with some nice over hand punches. Sayles still pushing forward until he slips and Moraes attacks his body with a body kick as he stands up. With less than a minute to go Sayles started touching his eye but the ref didn’t pause the fight. With his opponent hurting Moraes went on the offensive cracking Sayles with some huge body shots and more kicks as the second round came to a close. Sayles light on his feet to open the final round. Using low leg kicks that nearly drop Moraes to the ground. Sayles is pacing around the cage and hot after Moraes appeared to poke him in the eye for a third time. After the ref talked to both fighters the fight resumed. Significant bruising starting to form on Sayle’s back where Moraes has been landing those big kicks. Sayles landed a big right then Moraes returned fire with a nice left. Sayles catches Moraes with a big knee to the head and Moraes appears dazed, with Sayles patiently waiting. Moraes attempts a takedown and Sayles responds with a standing guillotine attempt that Moraes easily slipped out of. With one minute remaining Sayles surged forward with Moraes content to counter strike. Moraes connected with a good body kick and body punch but Sayles lands a spinning backfist and a nice cross. The fight ends with both fighters swinging then smiling. We head to a decision. UFC 227 Official Result: Moraes (29-28, 29-28, 29-28) defeated Sayles by Unanimous Decision. Perez all over Torres right away landing big punches. Torres already is swelling up around his left eye. Despite the strong arsenal of strikes from Perez, Torres isn’t backing down. Perez tagged Torres with a big elbow and opened up a cut on the temple of Torres. Perez is pouring on damage but Torres isn’t going away. Both flyweights are landing shots but Perez finally did enough to hurt Torres and send him retreating. After covering up against the fence it didn’t take long for Perez to chase Torres down and absolutely unleash on the wobbly Torres. Perez finishes the fight with big hook after big hook sending Torres falling to the canvas. Wow. UFC 227 Official Result: Perez defeated Torres by KO, first round 3:47. Zhang very aggressive right away pressuring Taylor and using a variety of kicks to keep Taylor on her heels. Effective striking Zhang before the two transitioned from the clinch to Zhang on top in a dominant position. After dropping a few elbows it was Taylor who went for a heel hook, but after Zhang slipped away both fighters jumped back to their feet. Zhang continues to use her front kick to push Taylor to the outside. In the closing seconds of the round Taylor hit Zhang with a nice 1-2 that had the crowd excited. Both fighters look fresh after the first but Zhang appears to be in control. Constantly hunting down Taylor and catching her with some nice hooks up against the fence. And after Taylor fired back and hit her with a strong cross Zhang cracked a big smile. Zhang is a brawler, she’s seeking out Taylor and isn’t afraid to take damage. She unleased a big front kick that sent Taylor flying into the fence. Taylor ends the round big cracking Zhang with a big right hook that sent sweat flying and the crowd cheering. The movement from both fighters is excellent, but Zhang continues to put together nice combinations followed by great front kicks. With less than a minute to go Zhang surged forward nearly missing with a head kick. Then the two met in the center of the Octagon swinging for the fences as the final bell rang. UFC 227 Official Result: Zhang (29-28, 29-28, 29-28) defeated Taylor by Unanimous Decision. The two fighters decided not to touch gloves and after feeling each out a bit it was Buren that struck first, catching Chito Vera with a good left. The Beast Master didn’t stop there, moving forward and pressuring Vera to the outskirts of the Octagon. With a 1:30 left in the round the fighters engaged in the clinch with Buren in the dominant position. The round ended after Buren slammed Vera down to the canvas securing a big takedown. Vera comes out of the gates in the second looking much more aggressive. Landing multiple shots that seemed to stun Buren, but Beast Master was able to regain his composure and take Vera to the ground. With Vera on his back, Buren looked to put pour on some ground and pound damage but the ref decided to stand the two fighters up. Then it was a big left hook from Vera that appeared to hurt Buren as he lunged forward to close the distance. Vera lands a good body kick as Buren hits him with a cross over the top but bother fighters keep pushing on. Vera put together a couple good shots and wrapped up the comb by taking down Buren with less than a minute to go in the round. Buren was able to get to his feet but just as the 10-second sticks smack Vera catches Buren with a massive left to the liver followed by two good hammer fists as Buren crumbled to the ground. UFC 227 Official Result: Vera defeated Buren by TKO, second round 4:53.